That a boorish, crude, poorly made video could set a whole region on fire with righteous rage and cause the death of a highly respected American diplomat and his staff is a sign of the dangerous new world we live in. I asked my media studies class yesterday to think about whether we are better off now than we were before the internet age, or whether the amount of time we all spend on the Web is dumbing us down by making us restless, superficial consumers of so much raw information and half-truths that we no longer have the time or inclination to sift through it all and figure out what really matters. My students, digital natives all, were enthusiastic about the interactivity of the internet, the unparalleled opportunities it offers for entertainment and lightspeed communication. But we all sobered down some when we contemplated the dark side of the internet promise, given form this week in the jump from You-Tube to Muslim Main Street. We watched a few minutes of “Innocence of Muslims,” the purported “trailer” for a full-length movie that may very well not exist. Actually we watched less than two minutes of the film, all that we needed to understand why it has angered religious Muslims. The film makes a mockery of the Prophet Muhammed, and presents the religion he founded as bloody and uncouth. I’d like to see how evangelical Christians would feel if a similar film was made about Jesus Christ and his religion. The Egyptian government issued a statement today recognizing that American filmmakers have the right to freedom of speech, and therefore cannot be prosecuted for their insulting production. But they can certainly be condemned. Hate speech is not allowed in the U.S., and this film walks a fine line; it is certainly insulting and intolerant, if not outright hateful. The film only made waves in the Middle East when someone translated it into Arabic, and then reposted it on You-Tube. Maybe they thought Muslims would think it was funny. No one is laughing, not at all. And the rage comes out against America and all Americans, even though the majority of Americans would be just as turned off by this film as anyone in the Muslim world. Even as I write that familiar phrase, “the Muslim world,” I know it’s false. The internet has shrunk our globe so much that the old boundaries between cultures and nations no longer hold. Out there on the internet, we’re all part of a vast interconnected universe of humanity, a distributed digital brain hosted by the global Cloud. We have the capacity to send images and words around the world at lightening speed, but on the ground we’re still the same old people we have been for hundreds of years, weighed down by our enmities and prejudices, our pettiness and our greed. The freedom of communication facilitated by the internet is marvelous, and few of us would want to see it censored. But we need to understand the power of words and images to manipulate and twist our perceptions of the truth. We need to learn how to become responsible producers and informed, discerning consumers of all the representations we send up to the Web. That ugly film does not represent America, any more than the savage reprisal on the Libyan Embassy represents the Muslim community. The internet should be used to connect us, not tear us apart. We need to be smarter than that. Hi Jennifer. I have actually watched this video and it is so poorly constructed – with liberal use of green screen technology to avoid expensive location shoots – I think most people would just laugh at it. Most people, that is, apart from Muslims. Unfortunately, any serious Muslim (are there any who are not serious?) will take offence at this video. I agree with those who say that people should not set out to offend other people but, even so, the other person always has the choice not to be offended. Most Jews and Christians do this all the time. However, despite the fact that I have not been inside a Church for several years, I still find the crucifixion scene at the end of Monty Python’s Life of Brian very distasteful… Which is a great shame because, I think the first 99% of the brilliantly conceived and executed; and absolutely hysterical. Nevertheless, even if there are – or should be – limits to legitimate freedom of expression, being offended by a movie is absolutely no justification for murder. Therefore, whilst it would obviously be better if it had not happened at all, I hope the attack on the Bengazi Consulate turns out to be a pre-planned attack by terrorists. But, even then, I am bound to ask, when will people in the Middle East (irrespective of their religion) learn that violence just begats more violence? When will they realise that the only way to stop the violence is to stop insisting that all spilled blood must be avenged? I trust that, in light of 9/11, the US Dept of Defense has already learned this lesson. Ha! If anyone needs to learn the lesson that violence begets more violence, it’s Pentagon and the weapons industry. Drones anyone? Special ops forces, secret detention sites, nuclear weapon silos, arms sales up the wazoo–not to mention the war in Afghanistan that just grinds on and on. 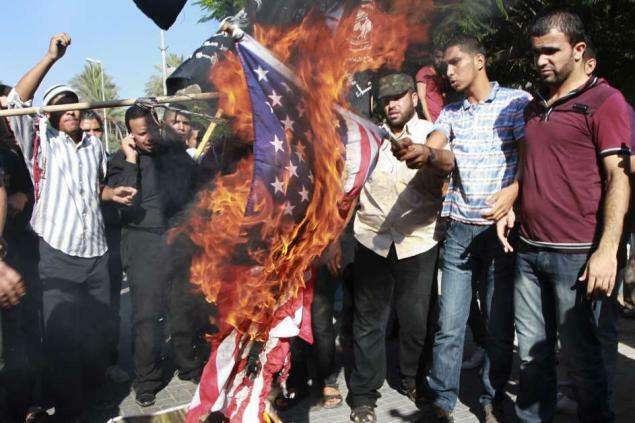 I really find it hard to fault the kids burning American flags in the Middle East when we leave ourselves so open to the perception that we are the purveyors and deliverers of evil–real and virtual. That said, I do think people all over the world need to become smarter, more educated consumers of media, so that they/we are not so easily led and misled. Teach those young kids to think for themselves, and maybe they won’t listen the next time their mullah goes ballistic about the Evil Empire of America. The same goes for Americans. We were too easily misled in the post 9/11 days, and I am afraid it could easily happen again, at least with the ever-growing sector of our population that is poorly educated (and you have to wonder if that’s by design). With freedom comes responsibility, and I think that the people who made that *utterly ludicrous* film, which couldn’t have been made for any purpose other than to anger Muslims, have some responsibility for the deaths at the US Embassy in Libya. But how *anyone* could take that film seriously is…awfully hard to believe. The acting is worse than I’ve seen in many a children’s Sunday-School pageant; the production values aren’t as good as the high school video nerd’s made in my day, and with the technology now, the production values are completely laughable. To answer the question about how Christian’s would take a similar film about the life of Jesus — I think they’d laugh the makers of the film back into the obscurity they deserve. They certainly wouldn’t decide to find the nearest person of the same nationality or background as the film-maker, and murder him. There is no way, I don’t care how insulted people were, that murder is an appropriate response *to a film*. If it is, as I’ve read, a case of the average Middle-Eastern working-class Muslim person assuming that any film available in the US is approved by the US government because they are used to strict government control of media in their own countries, then if these countries — such as Egypt — want to stay on friendly diplomatic terms with the USA — including places such as Egypt, where they get mega-millions in foreign aide, and where protesters with violent intent scaled the walls of the US embassy — then the governments of those countries ought to speak out, and tell people the truth. Ignorance is killing us! The kinds of ignorant people who would kill an ambassador who was apparently *a staunch friend of their country* need to konw that in the US, any jackass can make a video, and no American would have paid any attention to the jackasses who made that one except for the actions of people who committed murder in the name of Islam, and that no good can come of them committing crimes in the name of Allah. Ignorant people made the video; ignorant people murdered Americans in response; ignorant Americans are going to see this as a slur on their normal, nonviolent Muslim neighbors; do we really want our cultures to spiral down and down into violence and death because of mutual ignorance? I share your incredulity, mefoley, but you appear to overlook the high probability that the murder was not a response to the film; it was a delayed response to the death of Bin Laden. Nevertheless, the violence enacted upon US, British and even German embassies around the world (which was explicitly said to be in response to the film) is completely unjustifiable and – it seems – peculiar to Muslims. Unfortunately, just as bullies pick on those they know will react, I think this level of fanaticism and or low-self esteem, makes it all the more tempting for bullies to indulge in mockery of their “prophet”.